Temporary electronic tattoos could soon help people fly drones with only thought and talk seemingly telepathically without speech over smartphones, researchers say. Electrical engineerTodd Coleman at the University of California at San Diego is devising noninvasive means of controlling machines via the mind, techniques virtually everyone might be able to use. 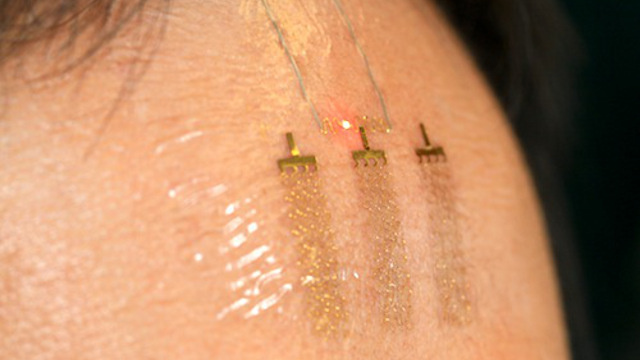 Using the electronic tattoos, Coleman and his colleagues have found they can detect brain signals reflective of mental states, such as recognition of familiar images. One application they are now pursuing is monitoring premature babies to detect the onset of seizures that can lead to epilepsy or brain development problems. The devices are now being commercialized for use as consumer, digital health, medical device, and industrial and defense products by startupMC10 in Cambridge, Mass. Top Image: The Neural Interaction Lab led by UC San Diego bioengineering professor Todd Coleman is working with Ricardo Gil da Costa, PhD, at the Salk Institute to examine the use of wearable flexible electronics on the forehead to monitor congnitive impairment with systems that are minimally obtrusive. 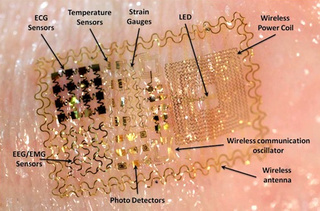 These patches of sensors monitor electrical rhythms of the brain and can wirelessly transmit information optically (via LEDs) or electromagnetically (via flexible antennas) to provide quantitative measures of attentional modulation that co-vary with the progression of dementia, Alzheimer’s disease, depression, and schizophrenia. 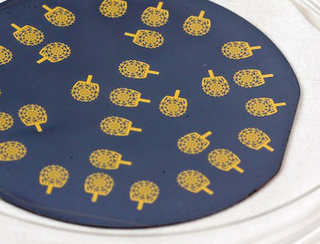 These minimally obtrusive wearable electronics provide promise for future clinical brain monitoring applications for hospitals and laboratories, outpatient clinics or even at home. Image courtesy Todd Coleman/UCSD. Bottom Image: Image of a piece of electronics with physical properties, i.e. stiffness, bending rigidity, thickness and mass density, matched to the epidermis. 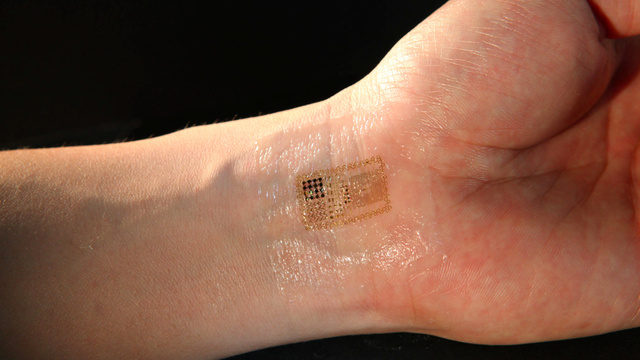 Such ‘epidermal’ electronic systems seamlessly integrate and conform to the surface of the skin in a way that is mechanically invisible to the user. The devices have the potential to provide a range of healthcare and non-healthcare related functions. Image courtesy John A. Rogers. This article was originally published at Txchnologist.